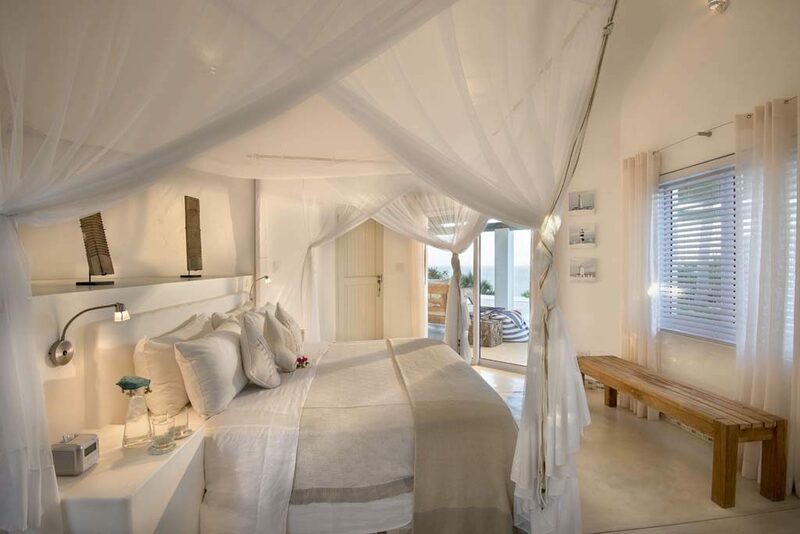 Located in Vilanculos Santorini offers luxury accommodation and stunning views, Vilanculos is well known as the gateway to the Bazaruto Archipelago and was one of Mozambiques first well known tourist destinations. The Vilanculos town itself is only about 5km long filled with all the amenities needed to make your visit comfortable yet local. The Vilanculos airport is based on the outside of the town with flights arriving and departing on a daily basis. 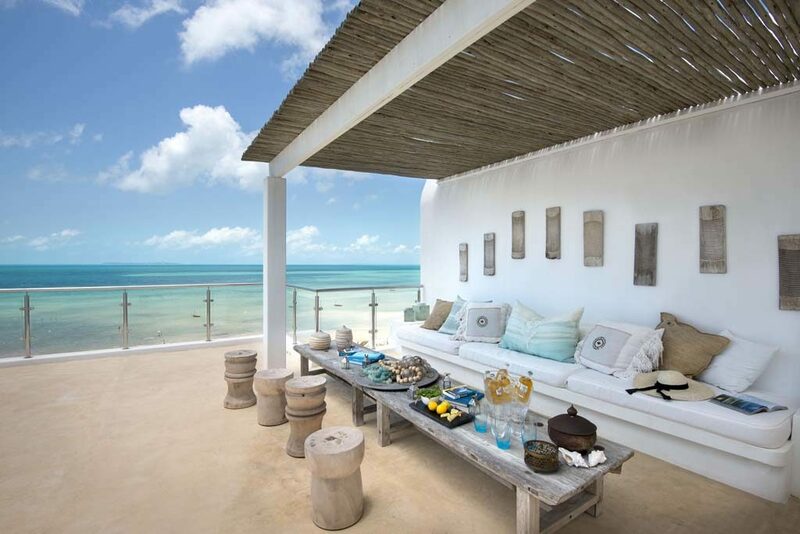 The Bazaruto Archipelago, a chain of islands strung out like a pearl necklace, is a protected National Marine Reserve (declared so in 1971) that lies parallel to the historical Mozambican channel. The archipelago consists of five islands; Bazaruto, Benguerra, Margaruque, Bangui and Santa Carolina also known as Paradise Island. 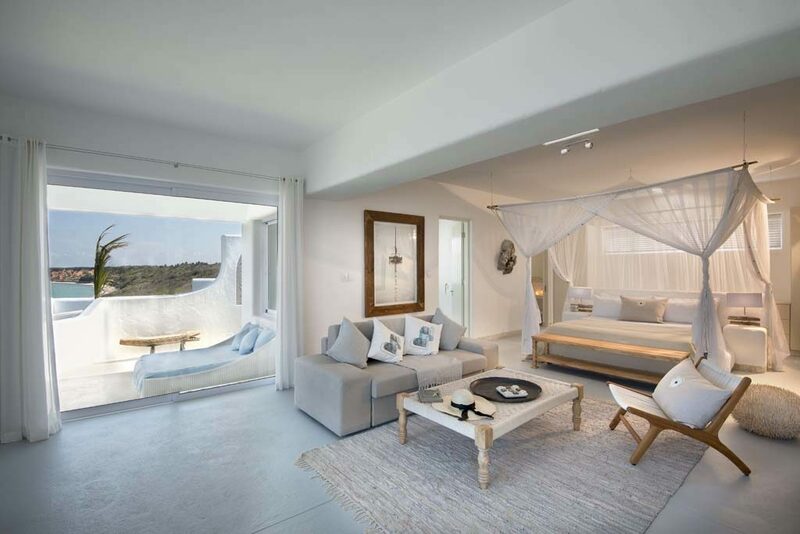 The Villa at Santorini is serviced daily with a full team to look after every need, including a chef and a villa management couple. There is secure undercover parking with electric fencing around the property, 24 hour guards and a gated entrance. A villa boat is available on request. Meals and local liquors are included. Children of all ages are welcome. 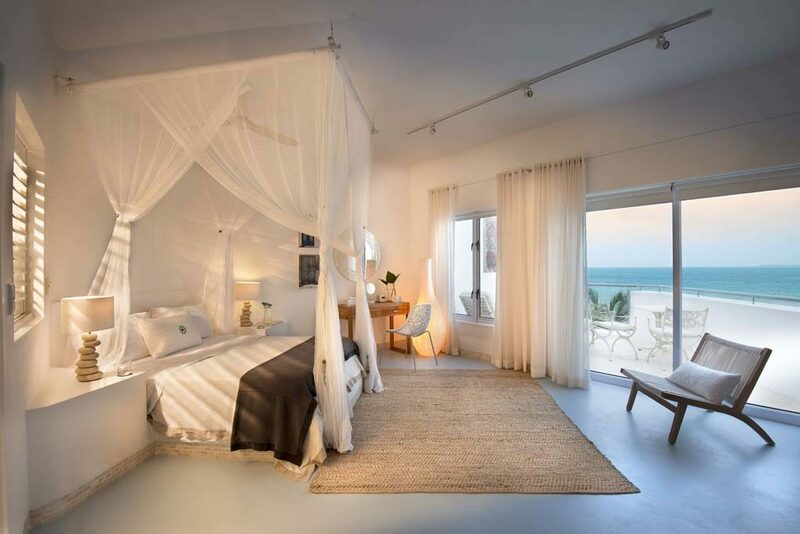 This Villa has Five majestic en-suite bedrooms that feature private balconies and breathtaking sea views. 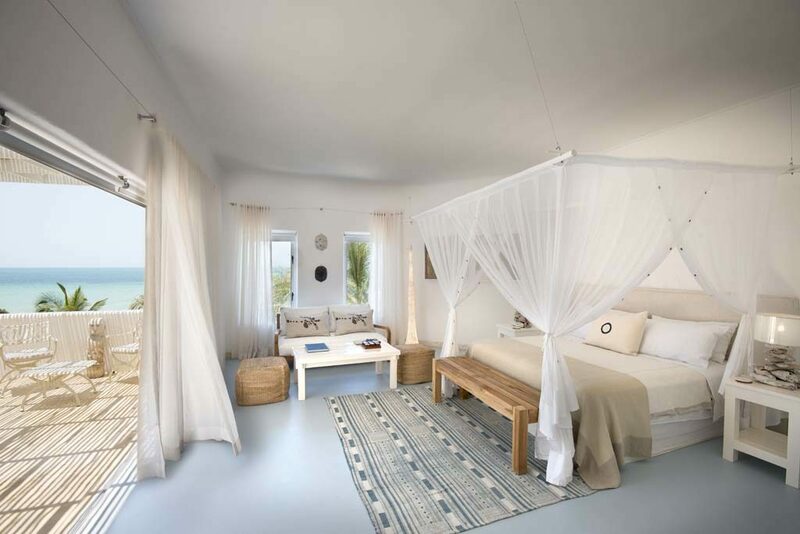 The villa can sleep 10 -14 people or 8 adults and 6 children. Outdoor: The shaded pool courtyard holds claim to an eternal view and an al fresco seating area beside a pizza oven and gas BBQ. 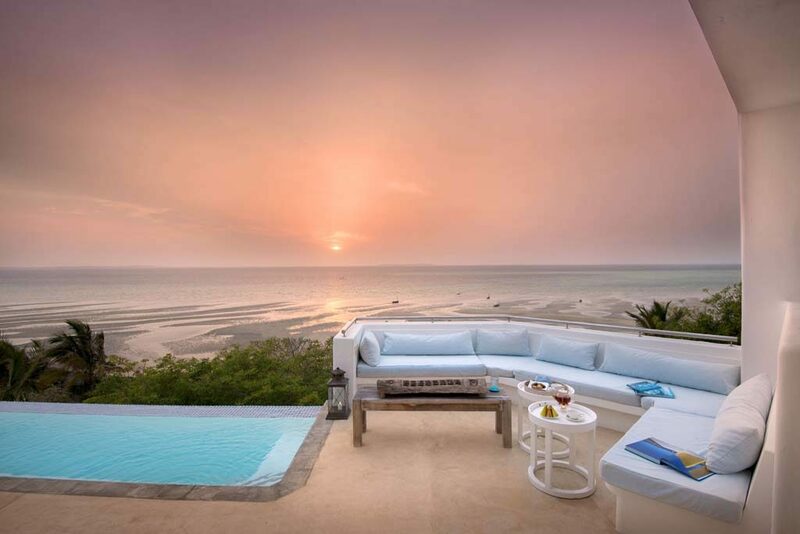 The ocean front deck has a pale blue martini pool which faces directly onto the sea. 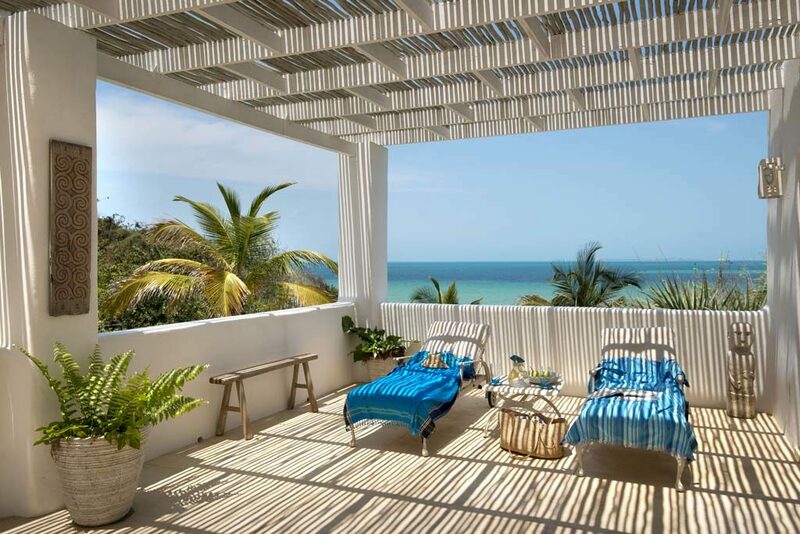 Relax, meditate, entertain on the covered sala, upstairs from the courtyard. Tucked below this is another deck for private massages or romantic dinners. The Villa has a staircase to the beach. 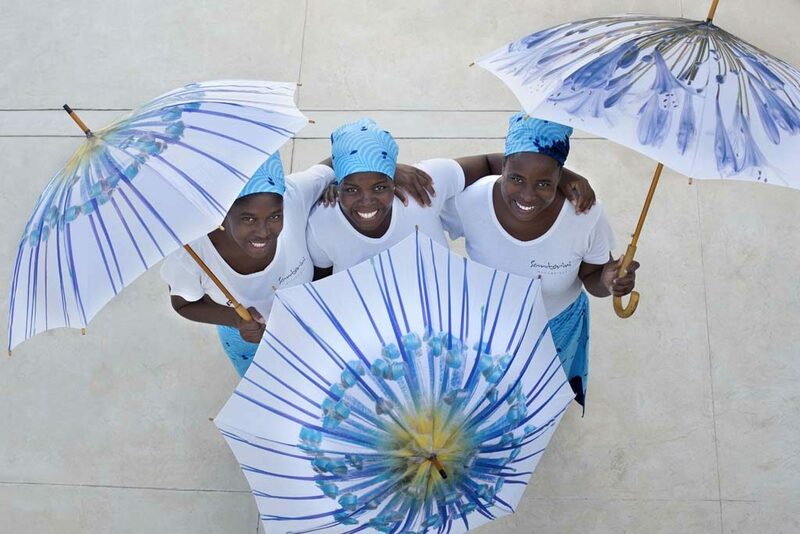 The villa has two kitchens – one where outstanding meals are prepared by our resident Mozambican chefs. 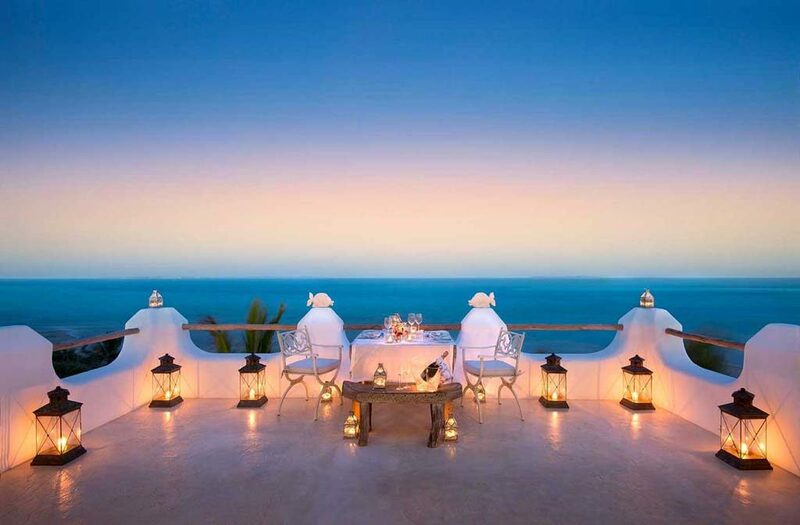 The other is purely for guest use should they wish to help themselves to an ice cold beverage,a cappuccino or perhaps a glass of wine of their choice. However friendly and personal waiter service is always available. 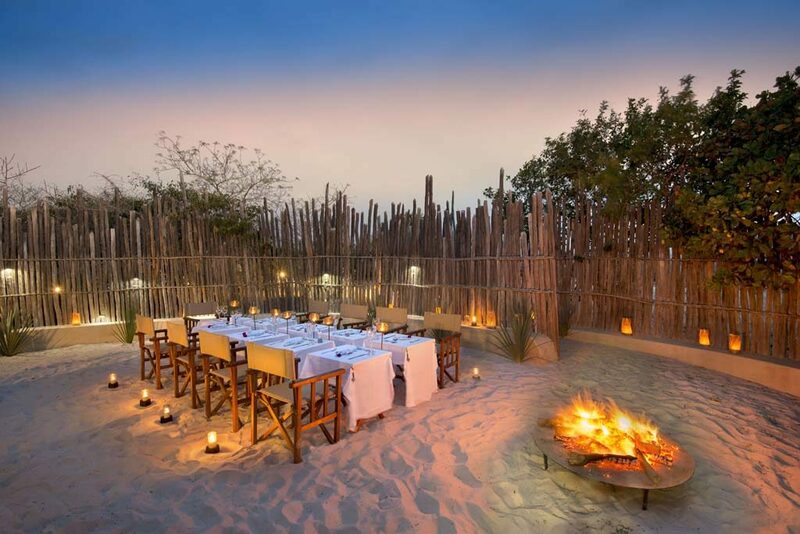 Experience the sensuous pleasures of Mozambique in this enchanting seaside paradise. 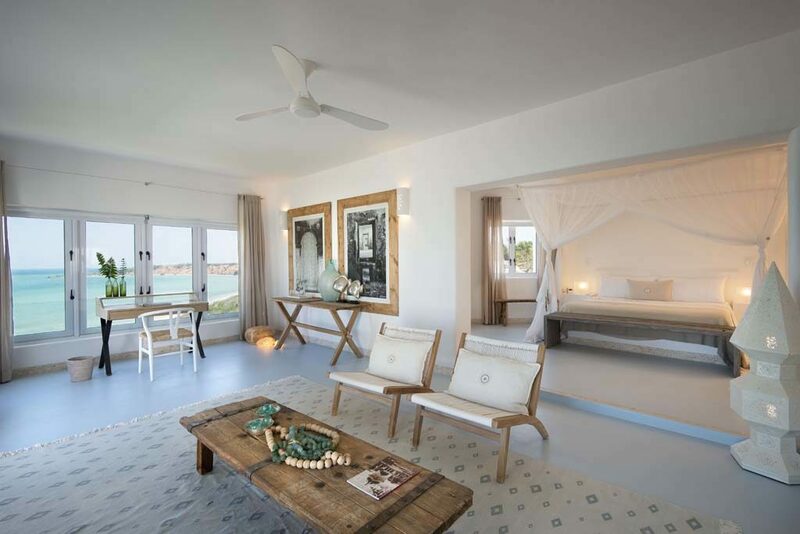 Villa Santorini is located a few kilometers north of Vilanculos on its own stretch of beach overlooking the Bazaruto archipelago. 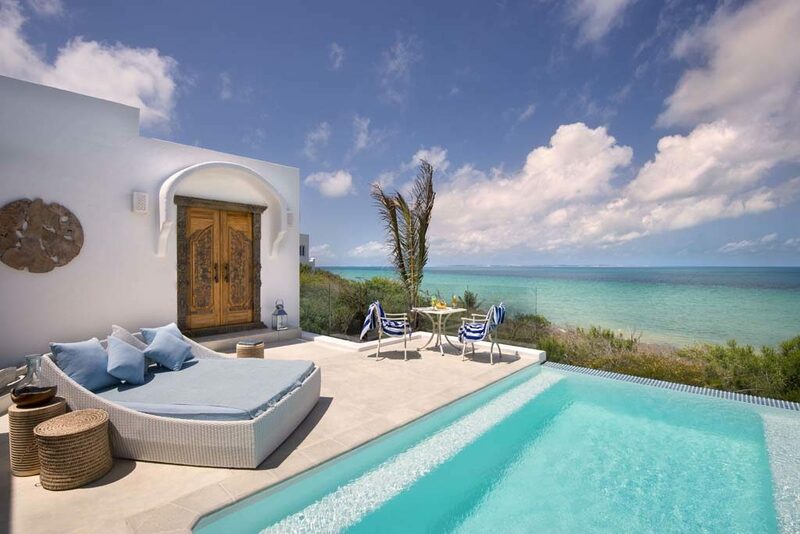 The villa rests on an elevated point surrounded by dense coastal vegetation, owning unparallaled views and privacy. 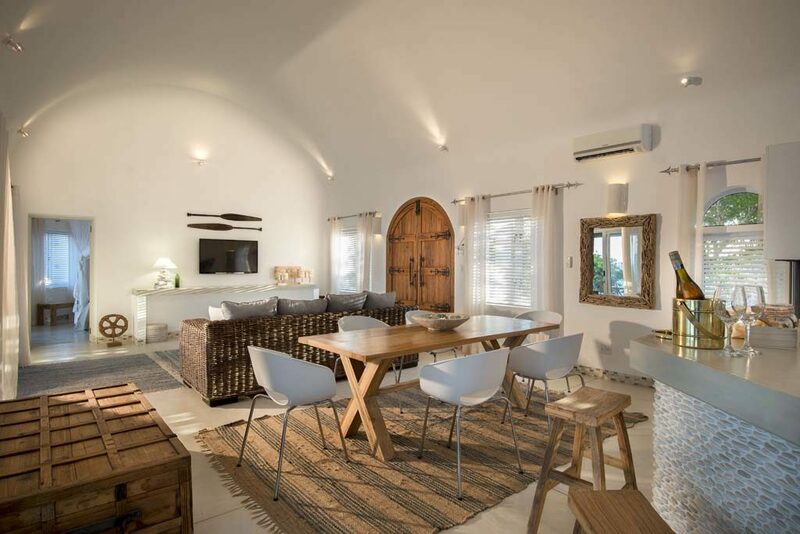 The Chapel at Villa Santorini is a one bedroom villa, ideal for honeymoon couples or romantic getaways. 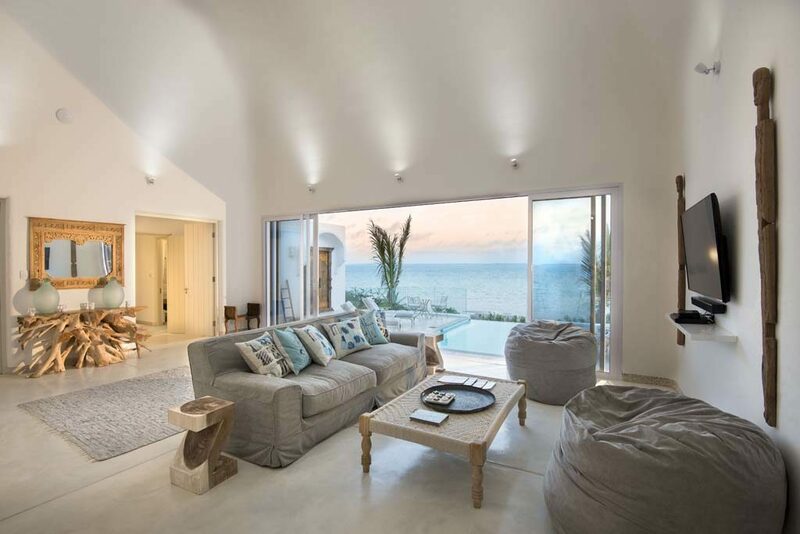 Ocean facing with its own lounge, kitchen and dining room. A private pool and outdoor dining area on the patio. The Chapel is a perfect luxury escape.